Polar bears (Ursus maritimus) in North America are divided into subpopulations for management purposes. The subpopulation that I am studying is Foxe Basin. The polar bears of Foxe Basin are not well known; the most recent studies occurred in the 1980s. Since that time the only other information collected has been hunter harvest (average 97/year) and defence kill data. 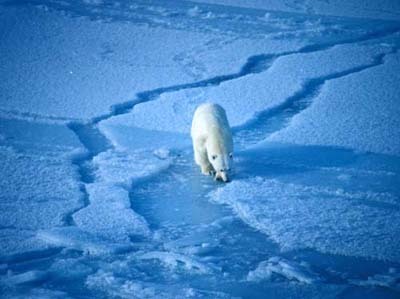 The Foxe Basin polar bear population is considered stable and estimated to be 2,300, although inventory data is outdated. Polar bears are predicted to be negatively affected by climate warming but regional scale quantitative models of the relationships of this species with sea ice habitat are lacking. My primary research objective is to understand and model how the annual evolution and dynamics of sea ice habitat influences polar bear movements and habitat selection in Foxe Basin. I make extensive use of remote-sensing technology: geographic positioning system satellite collars for tracking polar bear movements and satellite imagery for mapping past, present, and projected sea ice habitat. My analyses of historic sea ice data have shown significant temporal changes in polar bear habitat. To evaluate habitat selection, polar bear movement data will be plotted on sea ice maps using resource selection functions. To understand if and how sea ice directs polar bear movements, I will study bear movements in relation to patterns of open water features, sea ice growth, circulation, and melt. While satellite derived information is central to my research Inuit knowledge (traditional ecological knowledge) of polar bear movements, behaviour and habitat use will contribute to filling information gaps and will be incorporated into the ecological interpretations. To integrate the study, I will use a spatial explicit individual based modeling to forecast how climate change may affect the integrity of the Foxe Basin polar bear subpopulation. It is anticipated that this model will have application for other polar bear subpopulation. The study will have direct application to management strategies for the conservation of polar bears in Nunavut and other jurisdictions. My background includes many years working with Parks Canada and in a few capacities: park warden, planner, ecologist and manager of resource conservation. Most recently, June 2000 – December 2005, I was based in Iqaluit, Nunavut and was responsible for the ecosystem and cultural resources research and monitoring programs for the Nunavut national parks (Auyuittuq, Sirmilik, Quttinirpaaq and Ukkusiksalik). I supervised an interdisciplinary team and worked closely with many universities and organizations to develop and implement the research and monitoring programs. In my free time I enjoy running, hockey, bird watching, ski touring trips, backpacking traverses and hunting trips. I obtained my BSc from University of Guelph and MES from York University. In January 2006, I began my Doctoral studies at the University of Alberta.